Words by Kevin Doocey on June 1, 2014 . The infamous ‘line’ everyone associated with Newcastle United talks about is yet again proving to be the club’s achilles heel in the quest to sign talented midfielder Rémy Cabella. The 23 year-old Frenchman has long been admired by the NUFC faithful including Graham Carr, and it was thought that he was all set for a January move to the club, only for both parties to scupper tentative negotiations headed by two questionable characters in Montpellier owner Louis Nicollin and indeed then NUFC DoF, Joe Kinnear. 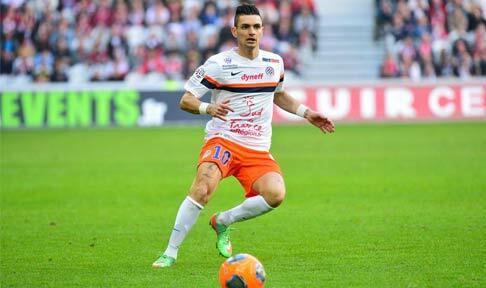 Media reports from France even suggested that Montpellier had agreed a deal to sell Cabella to Alan Pardew’s side in the summer, rather than January, in order to keep Rémy for the club’s relegation scrap in Ligue 1. Such an agreement looks a bit frail now, doesn’t it? The latest story emerging from across the sea is that their owner has raised Cabella’s asking price to €12m, whereas Newcastle lodged a formal bid of about €8m. If you ask me, there should be no confusion over this deal, throw in an extra €2m to bring it to €10m and I would be surprised if a move doesn’t happen. However, such deliberation on behalf of finances has always been Newcastle’s downfall under Mike Ashley’s ownership. According to sources within the club, and although it is incredibly obvious to the average eye - MA looks to account for every penny spent within the club. The balance sheets are explored and every expenditure must be explained. I suppose it is a reason he has become such a successful businessman. As you might have read over the past few weeks, clubs in the Premier League received a hefty boost in their TV rights income. Newcastle received about £77m in TV revenues for the past season, a rise of over £30m on previous seasons. In that increment alone, we could buy 3 Rémy Cabella’s never-mind just one. With that extra cash influx, there is absolutely _no excuses_ in our pursuit of Cabella. This guy is a French international, and a very talented midfielder - the club’s prized asset. However, NUFC make almost insulting bids to his club, with £6.5m the latest submission. Stupid, and downright disappointing. The hope is that the clubs will come to an agreement, and it is likely that the recruitment staff will plea a stronger case to Mike Ashley to top-up their initial bid. I am positive there will be another bid from Newcastle, but I highly doubt it will be exactly €12m. I’d love to think that they’ll just pay the asking price, but in a more likely scenario - they’ll bid nearer €10m. The question is - will Montpellier become even more insulted, or will they accept the offer and let Cabella leave for the hallowed turf of St. James’ Park? Only time will tell, but we hope for some positive news, there is no reason why the club should fail in this quest. In the meantime, feel free to add your thoughts below, and follow me on Twitter @KevinDoocey. Porciestreet; WE are talking My Cashley here, everything and nothing is possible. God help Newcastle United. dont see the problem, will be a another cabaye. buy cheap, sell high. I've seen this guy play - he's good. look at this from ashleys point of view, its a good investment, get a player thats great who helps bump your team up the league and when all the big clubs come knocking in a few seasons double your money.....c'mon d!ckheed, get your fat wallet out!